One of the best things that happened to us (the Lees) in the summer of 1963, when Norman and I first came to live at Woodlands, 111 Longhurst Lane, in Mellor, was the warm welcome that we were given by everyone we met both in the street, in the nearby shops and by all our neighbours. Having our first newborn baby must have helped introduce us to the community and, also, the ladies who lived in the house before us told them that we were coming. A related advantage was that we were young, in our twenties, whereas most of the neighbours were much older, longstanding residents. Because of this, they were able and happy to tell us about some of those who had once lived in our house, who they were, what they were like and some of the things they did. We also learned of others who had lived in some of the houses nearby. These stories, as I prefer to call them, gave substance to the history of the house as we read it in our deeds, and to some of those around us. 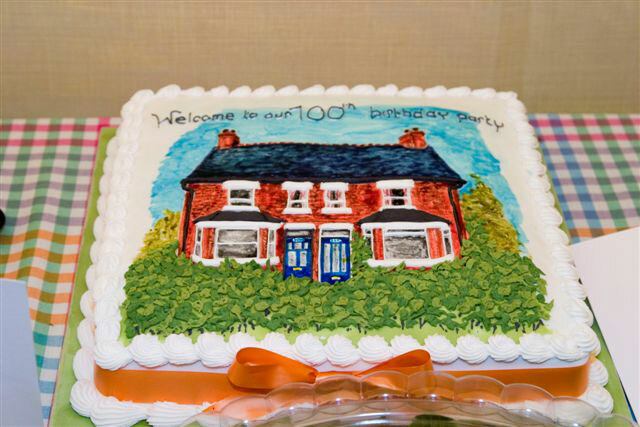 It helped stimulate my love of local and social history and has now led me to investigate further the “life” of my house and that of the other half of our semi (Glenholme, 109 Longhurst Lane) for their combined 100th birthday, which was celebrated in 2006. As I have lived longer at 111 than any of the former owners and residents and Judith Cooper, my next–door neighbour, is one of the longer residents of 109, we are in a special position to be not only recipients of these stories but also feel an obligation to pass them on, together with some of the documented history discovered about our houses and the lives of their former occupants. Not long before we moved here, house numbers were introduced into Longhurst Lane. Before this, houses were known only by names given them by former owners. Our front gates and gateposts displayed names rather than numbers. In addition, local people knew our house as “Mrs. Wolfenden's House”. It took a long time for it to become truly ours in the minds of the rest of the village. Around the turn of the 19th and 20th century, there were few buildings along the whole two miles or so of Longhurst Lane. The six–inch Ordinance Survey map of 1899 illustrates this very well. There were the old seventeenth and eighteenth century stone cottages and a stone–built farmhouse, most of which survive until today. There were a few brick buildings too that amounted to the brick row about three quarters of a mile up the lane which includes the Royal Oak public house and the adjoining Royal Oak farmhouse and barn. The rest of the land bordering the lane was farmland, mainly pastures and meadows. During the early years of the 20th century, William Jowett, owner of Cataract Mill who also owned Worthington Barn Farm just above the mill, sold off as many plots of land as he could along the roadside. If our deeds are typical, he sold them as leasehold property on 999 year leases with ground rent upon the new houses that were built and their garden–land payable to him and later, to his estate. Those who bought the land were required to erect buildings, either residential or commercial, within twelve months of purchase. A rush to buy followed. Builders, agents, and those who wished to erect single dwellings for either their own occupation or as an investment (to rent), were eager to take advantage. Plots of land were also sold on the other side of the lane. It is clear, from the deeds of Woodlands (111) and the Land Tax Survey of 1910, that Jowett not only wished to line Longhurst Lane with buildings but also had it in mind to build on some of the fields behind them. He designated a strip of land, behind that which he had already sold for building, as a road to which he even gave the name of Herbert Road. This road, according to local people, was to emerge part way down the stretch of Longhurst Lane known locally as Cataract Brow. This plot was left vacant for a long time and was the last to be built upon some seventy or eighty years later when it was given the number 103. Walter Stafford, a solicitor's clerk, was living in a rented house on the Glossop Road known as Newport Villa when he bought, in November 1906, the plot of land on which our two houses now stand. At some time during the following twelve months, he commissioned builders to erect Woodlands and Glenholme and moved into Woodlands soon afterwards. Glenholme was rented out, possibly to William Fairbank who was the occupant in 1910, according to the Land Tax Survey taken that year. A plan in the deeds of the land Stafford purchased in 1906 shows not only details of the plot itself but also a little of the plots on either side. Houses were already built upon them. Outlines of the buildings are recognisable as those existing today. Woodlands and Glenholme were built as mirror images of one another with neither house having advantage over the other until later, with the purchase of extra garden behind Glenholme, in 1909. For some reason, yet to be discovered, William Jowett did not build on all of Worthington Barn Farm and our neighbours told us that he had sold it to a builder. However, at the time of the 1910 Survey, he still owned and occupied the field beyond our gardens. Perhaps he already had it in mind to sell it for building as he offered extra land from the field immediately behind their gardens to the owners of all the houses erected by 1909. Most purchased this land but a few did not. Walter Stafford's tenant, living in Glenholme, apparently did not want any more garden–land and so, since he still owned the whole plot, Stafford purchased all the extra land on offer. He added this to his existing garden behind Woodlands making a larger garden which curled around behind Glenholme's garden and thus the difference in area of the two came about. Later still, someone negotiated another narrow strip along the bottom of the whole plot. Part of the reason for doing this may have been to try and prevent a road from being driven through the remaining steeply inclining land to the previously proposed exit of Herbert Road, now covered by house 103. The occupants of 107 similarly rented or leased still more extra land at the bottom of their garden. From the Land Tax Survey of 1910, known by some as the “Modern Doomsday Book”, it can be seen that Walter Stafford also built, or had built, several more houses further up the lane that he seems to be renting out. It appeared that he was occupied in developing available building land. Vessey Brothers of Mellor were his chosen builders. This firm occupied wooden–built offices and a builder's yard where a new bungalow and Randfield's Architects office now stand on the Mellor side of the stream alongside and including the Forge Mill site. It was these builders that built Woodlands and Glenholme. James Pott, a builder from Marple, was also buying as much land as he could, judging by the various plots under his name in the Survey. As well as the Jowett land, part of the Arkwright estate on the other side of the lane was also being sold off. Longhurst Lane was rapidly being transformed from a rural lane into a residential road, no doubt encouraged by the easily accessible railway station on Brabyns Brow. Mellor was changing from a rural community dependant upon its waterside cotton mills and farming to a dormitory village peopled by those who earned their living in Manchester or other towns along the route of the railway line. The plans for the plot, on which Woodlands and Glenholme were to be built, show that there was already a piped water supply to serve the houses and it was suggested some time ago by older residents that Jonathan Jowett, William's father, had built large water–collecting tanks further up the village. Jonathan Jowett was a mine–owner who owned a number of coal mines in and around Mellor, including the one deep mine on the top of Cobden Edge. (When we first came to live in our house, there were those around who nostalgically recalled the good quality of “Mellor water”). The water–supply for Woodlands and Glenholme was delivered on a shared piped system, coming in through the front garden of Woodlands and entering the house at the back corner via the cellar from where it branched to penetrate the parting wall between the two cellars providing a supply for Glenholme. The sewer travels underground from the soil–pipe next to the cellar door in Woodlands, downhill and across the back of the houses, turning to join up with a similar sewer from Glenholme and from thence towards the roadside boundary to join the main sewer leading down the lane. Lighting was provided by gas which came into the garden of Glenholme and was, again, a shared facility entering the houses via the cellars. Both houses have signs of fittings for gas mantles, visible on the walls when they were stripped down to the original plaster for redecorating. (Some of these walls were originally painted bright red.) The Marple Gas Company situated in Marple Bridge, on Lower Fold, adjacent to Ludworth Primary School, probably supplied gas to our houses. From various signs it can be seen that both buildings were intended to house a family with probably one resident servant. The front half of each house consisted of two reception rooms (these could be used as a sitting room and a dining room) on the ground floor leading off a hallway. The hallway had a small section at the front separated by a door described as a vestibule. The vestibule has just enough room to take off your outside clothing and a mat well with a coconut mat on which to wipe your feet. From this hallway rose a staircase to the first floor. The houses were and are still divided from each other by a single–brick parting wall from the ceiling of the top floor to the foundations. The hallways of both houses are adjacent. The two bedrooms in the front half of the house consisted of the master bedroom, stretching across the front sitting room and the hallway, and the bedroom behind that above the dining room, covering the same area as the room below. These two bedrooms were approached from a landing, which is another step up to the right from the head of the stairs. The back part of the house, which was mainly the province of the servant, still contains three floors: the top, or first floor, the kitchen on the ground floor and the cellars or semi–basements. The top floor has a short landing from the head of the stairs off which is a toilet separated from a small bathroom. The bathroom has a bath, a washbasin and a cupboard for the copper hot'water cylinder suspended over the bath. At the end of this landing is a small bedroom at the back of the house, which would have been the servants room. (The bathroom and toilet were most likely intended to serve the whole household, including the servant.) The ground floor, in this section, is raised from the actual ground level by several feet. It still contains a large kitchen, which has three doors : one to the hallway through the house, one to the garden and another in the corner to the “inside” cellar. The door to the garden opened to a small stone platform and three stone steps to the ground in Woodlands but more steps for Glenholme, taking into account the slope of the land. In Woodlands, we have since built a porch to enclose the stone platform which we have extended. We have shifted the steps to the end of the porch which is enclosed by another door. The lowest floor, or semi–basement, contains two cellars. One cellar could only be approached from the outside, hence the reason why we (the Lee family) call it the “outside” cellar. The "inside cellar" was accessible only by a door from the corner of the kitchen. We have since knocked through from the inside cellar to the outside cellar and have inserted a small wooden door to connect the two cellars. The kitchen, when we first moved in, contained a very large wooden cupboard that extended from the floor to within about a foot (around 30 centimetres) of the ceiling. A large shelf ran from the top of this cupboard to the top of the door leading to the garden. On the wall, near the back door and also near the door leading from the hallway, was a bell–box containing bells labelled for all the rooms in the house. Wires beneath the floorboards connected each room to the bell-box in the kitchen, presumably intended to call the servant from the kitchen. There was a bungalow range on the back wall in which a coal fire heated a back boiler with pipes travelling upwards to the cylinder in the bathroom and a combined flue that could pass around an oven alongside the fire or, if you pulled a lever, rise directly upwards to connect with the flue in the bedroom above and from thence to the chimney pot. The cupboard has since been removed as has the bungalow range and fire place. There are now cupboards lining the walls and an inset airing cupboard in place of the fire place and range. The airing cupboard is warmed by pipes from the central heating boiler in the cellar below. The stone platform outside the kitchen door was, and is still, suspended above three more stone steps leading down to the door below the platform from which you enter the “outside” cellar. This is a large room, the same size as the kitchen above it. It contained a place for the coal sectioned off by a large stone flag reared up on end, a lavatory, a stone “pig-killing” sink and slab and a place for a possible stove to heat water. To my knowledge, there never was a stove there. As there is a large green cast iron wringer in Woodlands' cellar that looks old enough to have been placed in there when the house was first built, it would seem that this cellar was also intended to be used as a laundry, as it is today, but now with electrical aids, for example, there is an automatic washing machine for the present inhabitants of Woodlands, the mangle is no longer used. The lavatory, which was not enclosed in any way, has also been removed. Our neighbours in Glenholme have not copied us. Neither have they knocked a door through between the two cellars as we have done. As a result of this alteration, we can enter the “outside” cellar from the “inside” cellar and so perhaps their nicknames are no longer as appropriate as they once were. Every room on the ground floor has a window on two of their walls making the house very light, but the hallway has no natural lighting apart from a window from the vestibule. In addition, the hallways of the two houses, lying side–by–side in the middle of the building, makes for difficulty when it comes to contemplating extending the houses, but so do the windows. Although I would never want to lose any of my windows, they can present problems when you are considering alterations and enlargements. As a consequence, we, in Woodlands and Judith's family in Glenholme, have divided our large front master bedrooms to create two rooms from the one in each house. Each of us has done this in an individual way and this, together with other alterations and additions, has eliminated the mirror image the two houses once presented. Former residents of Glenholme, Mr. and Mrs. Booth, and we, both built garages to house the cars we had formerly garaged off Parkside Road. In the 1960s there were wooden garages behind the butcher's shop whose wooden shop faced the road close to the junction of Longhurst Lane. These garages belonged to Des Carline, the butcher, who owned the shop in the 60s. He had bought the shop from Henry and Bernard Hall. Henry Hall lived at either 121 or 125 Longhurst Lane. Bernard, who lived in a bungalow further up the lane and was the younger of the Hall brothers, sometimes helped Mr. Carline in the shop. One of the things that I remember about him was that he cut all the bacon by hand, resisting the use of the electric slicer. Although he had his own reasons for this, the bacon that he cut tasted far better than the same roll cut on the slicer. It may have had something to do with the thickness but I could always taste a difference. Mr. Carline was well known for handing out cheese samples, particularly to all the children who accompanied their mothers to buy meat. These samples were generous portions and the psychology worked upon their mothers who, feeling that they should pay for such a slice of cheese, more often than not found themselves buying more cheese, whether or not they had planned to do so when they entered the shop. The Land Tax Survey of 1910 shows that the rateable value of both houses was the same £17 and 12 shillings. Mr. W. (William) Fairbank was renting Glenholme from Walter Stafford and Walter, himself, was living in Woodlands. In September of 1910, the Fairbanks moved up the road to the newly built “Guy Cliffe”, later given the number 150. This may have been another rental from Walter Stafford who appears to have ownership of several houses around that part of the road. Two years after the Survey, Stafford sold Glenholme to William Hilton Lomas who lived there with his wife Harriet until 1925. Meanwhile, in 1920, Walter Stafford sold Woodlands to Julian Albert Bee and, with his wife Elizabeth, moved to an unknown destination. Julian Albert Bee moved his parents into Glenholme when it became available in 1925 and his father, Julian Tilley Bee, purchased the house from Lomas. Soon afterwards, his wife Elizabeth (Julian Albert's mother) died and was buried in St. Thomas's churchyard, Mellor. Julian Tilley Bee appears to have been born at 7, Welby Street, Grantham in 1853, one of three children (according to the census taken in 1861 when he was 7). His father and mother were Robert and Ann Bee, who were working as a tailor and dressmaker respectively. The first daughter, Mary E., was born when her mother was 24, the second daughter when she was 31 and their only son when she was 34. By the time of the next census in 1871, seventeen–year–old Julian Tilley Bee was to be found working as a waiter and living in at The Man and Saddle Inn, All Saints, Dewsbury, Yorkshire. Assuming that he later married Elizabeth, and going from the date of his son's birth, he may have married around 1875–6.Their son, Julian Albert, was born in 1877 in Salford, Lancashire. Despite his birthplace being given in the 1901 census as Fulham, I think it more likely that the closer to the event itself, the more accurate the information is likely to be. Julian Tilley Bee, his wife and son, moved around the country a lot, with a number of changes in occupation, each one seemingly unrelated to the former. In 1871 he was a waiter at an inn; in 1881 he had become an advertising clerk; by 1901 he was a book publisher. He lived in Dewsbury, Yorkshire; at 26, Shakespeare Crescent, Barton upon Irwell, Lancs; and at 3, Tatton Road North, Heaton Moor, Lancs. In between, he may have lived in Nottingham as his wife originated from there; Salford where his son was born; and Fulham, a suburb of London, which they gave as his son's birthplace in 1901. The fact that they apparently couldn't remember where their son was born would suggest that they were in the habit of changing their abode frequently and the addresses given in the census once every ten years show that they travelled to different regions of the country at a time when the greatest distance travelled by many families was just a few streets away to a larger room or house as the family grew in size. So far, I can see no evidence that Julian Tilley Bee had any other children than his son, Julian Albert who was unmarried in 1901, aged 24, living at home with his parents in Heaton Moor. Later he married Eveline Ridge (shown by house deeds and newspaper reports) but they appear not to have had children. Although, in adult life, Julian Albert Bee also moved around, he seems not to have ranged as far a field as his father. Unlike his father, once he acquired his profession, he remained in it. In 1901, aged 24, he worked as a banker's clerk. Shortly before 1920 he lived in Buxton, Derbyshire, still working as a bank clerk. He and his wife moved to Woodlands in 1920, where he remained until 1946. During this time he remained a bank clerk until his retirement, probably in 1937, and also continued living in the same house in Mellor where he and his wife lived for 26 years. About two hundred yards up the road was a small branch of the District Bank. This later became a newsagents shop and is now a private dwelling. In Marple Bridge there was another branch of the same bank now a Chinese restaurant. Julian Albert may have worked at either of these branches. Shortly before his mother (Elizabeth Bee) died, his parents bought the house next door to his – Glenholme, the other half of the semi–detached. His mother was 73 and his father 72. The deeds show the sale to have taken place on 14th May 1925. His mother may have been in poor health at the time as her death occurred a little later in the same year. Another twelve or thirteen years passed before Julian Tilley Bee died in 1938, aged 84, and was also buried in the churchyard of St. Thomas's church, Mellor, the resting place of his wife. Julian Tilley Bees sole heir and executor was his son Julian Albert Bee and, as a result, Glenholme (109) came into his possession. The following year, 1939, Julian Albert Bee, "sold" both Woodlands and Glenholme to his wife, Eveline, but continued to live at Woodlands with her until 1946. At some time after the death of Julian Tilley Bee, Florence May Cooper, who was Eveline Bee's sister, and her husband Arthur Robinson Cooper, moved into Glenholme. Before the Second World War, the Bees had a reputation for holding tennis parties. Older residents told me how they enjoyed these occasions. The back lawn of Woodlands had been laid out as a tennis court. Tennis appears to have been a popular sport in Mellor as Woodlands was not the only house to have a tennis court laid out in its garden. Neighbours described Eveline as a large woman and her husband, Julian Albert, a small man who had a reputation for being “fussy”. When the Second World War erupted, he appointed himself the local air-raid warden. He would go around his neighbours' houses looking for chinks in their blackout curtains and knock on their doors to tell them if he found any. Mr. Bee must have been very worried about the possibility of Mellor suffering bombing raids as he had built an air–raid shelter in the garden of Woodlands. This shelter had double skin brick walls and a concrete roof, about 12 inches thick. It was an L–shaped construction, but too low for any occupants to stand upright. An electric cable was strung between the corner of the house and the shelter for lighting. Whether or not this shelter was ever used during air attacks is not recorded. The only evidence for the Coopers living in Glenholme is the witness signature and description on a deed of assignment from Julian Albert Bee to his wife in 1939 where Florence Cooper is described as a married woman of that address. In 1946, Eveline Bee sold the two houses by auction and both the Bees and the Coopers moved to live further up the road at Braemar (191), about a quarter of a mile away. The Coopers appear to have moved first but there may only have been a short time between the two moves as both Woodlands (111) and Glenholme (109) were auctioned at the same time. The profit made by Eveline Bee on the sale of the two houses may have financed the purchase of Braemar, which was converted into two flats with the Coopers living upstairs. In 1953, Florence Cooper was no longer recorded at Braemar in the Electoral Rolls. Her husband remained on the role for this address as did Julian Albert and Eveline Bee. The following year, on 14th September 1954, Arthur Robinson Cooper murdered his wife Florence. According to reports in the Stockport Advertiser, he had stabbed her with a carving knife and a chisel. Her death certificate, quoting the post mortem examination, shows that she died of shock and haemorrhage from multiple wounds of the head and chest. A day or so after the killing, Arthur Cooper walked into a police station and told the officers that he had murdered his wife. The police found her body seated in an easy chair, wrapped around with an eiderdown, in the upstairs kitchen at the back of the house. Shortly after we moved into 111, Mrs. Shaw, who ran the branch of Greenwood's bakers about eight doors up the road, now converted to a dwelling house, told me about the murder. This event still figured vividly in the memory of local people. According to a newspaper report, Arthur Cooper was said by everyone to be a quiet, kind, pleasant man who was very religious. He was a church deacon at the Congregational Church in Marple Bridge where he and Florence sang in the choir and took part in amateur dramatics. Their marriage was believed by friends and family to have been a happy one although they had no children. His brother–in–law told the newspaper that Arthur had never been the same after he had been invalided out of the army in 1920, discharged due to the effects of severe sunstroke contracted in Mesopotamia (modern day Iraq). His suffering took the form of severe headaches, depression, and two nervous breakdowns. When he reported the murder he told police that his wife and he were very happy but this happiness was about to finish. He told them that he saw it as a kindness to end his wife's life before the forthcoming unhappiness enveloped them. Doctors decided that he could not comprehend the enormity of his crime and did not believe he had done anything wrong. A coroners inquest was held in the council offices at Marple after which Florence was buried in Southern Cemetery in Manchester, about a week after her death. Only members of her side of the family seem to have attended but her sister, Eveline Bee, was not amongst them, nor was her brother–in–law, Julian Albert Bee. At Chester Assizes, Arthur was found unfit to plead due to insanity and the judge ordered him to be detained at Her Majesty's Pleasure, (a phrase used for imprisonment without a time limit), most likely in this case at Broadmoor Hospital for the Criminally Insane. At the time of the murder, the Bees were away, holidaying in Anglesey where the Coopers had planned to join them. If the Bees did return, there is no evidence of their attendance at Florences funeral and they appear, at some time after, to have left Mellor for good. When Eveline Bee sold the two houses by auction in 1946, they were purchased separately for two families. In the case of Glenholme, the Booth family, who apparently bought the house, lived in Hyde. However, the family for whom it was purchased was that of Raymond Booth who was about to be demobbed from the forces that had been fighting the Second World War. His wife and two daughters were living in the Southwest at the time of the purchase. Woodlands was bought by Hilda Wolfenden for her mother, the widow of the late pastor of the Congregational Church in Charlesworth. This purchase was probably made in order to provide a home for Mrs. Wolfenden when the church required the Manse for a new pastor. Raymond Booth and his family, on the other hand, had been sent to buy what they thought was Woodlands and found that they had bid for and purchased the wrong house. His wife who, it seems, never quite forgave him, told me this later when I had moved into Woodlands. The large garden would have been ideal for their family of two small daughters, later to become three girls. Mrs. Woldfenden, her daughter and later, her widowed sister, Mrs. Francis, lived in Woodlands. Their brother, who worked as a psychiatric nurse at Cheadle Royal Hospital, joined them later. He was in charge of the gardening, providing vegetables and fruit for the family who were not at all well off. Nevertheless, they used to share some of their produce with their neighbours. After a while, Hilda Wolfenden married and moved away. In an effort to maximise their income, the family took in lodgers to occupy the small back–bedroom. On at least one occasion, we were told, there were two young men living in this small room. Over the years there were several lodgers. One of them was a Polish ex–service man who had managed to escape the massacre of the Polish army and intelligentsia by the Russians, which took place in the Katyn Forest. His name was Alexander Wiejak. He later married a local girl whose first name was Mary and they moved further up the road to live in 119. Although he worked in industry, he was a brilliant mathematician who could easily have taught the subject at a high level. I think that he may have done this at one time when living in Poland. They had three sons who, in due course, moved away. Alec, as he was called locally, died in his fifties after which his wife moved away from Mellor to a smaller house. Mrs. Wolfenden was known to take the opportunity of asking her lodgers to help with various aspects of house maintenance. They were probably not charged a great deal of rent and so perhaps expecting them to do a bit of decorating or the like was not amiss. By the time Norman and I came on the scene, their brother was going blind and so unable to do much in the garden, and their younger sister, who lived in the South and had been recently widowed, moved in with her siblings. She persuaded them all to move to North Wales and so they put Woodlands on the market. Not wanting to employ an estate agent to help, they put an advertisement outside the post office at Marple Bridge where Norman saw it by chance as he explored a little further downhill before we caught a train back to our rented house in Cheadle. As our lease was running out, we had been house–hunting in Marple. When we returned north after marrying in Southeast London where I lived and Norman was lodging whilst studying at the LSE, we rented a furnished house in Cheadle. Knowing that we had just a two–year lease on this property, we began looking around for a house to buy. After two years, we had some idea of the sort of place in which we wished to live and so we began house–hunting. By that time, we were also expecting our first baby and it quickly became more important that we should get ourselves settled before the baby was born. At the tail–end of a visit to the Marple area, when we were about to take the train back to Cheadle – always a difficult journey – Norman decided to take a look down the hill. The advertisement he caught sight of in the advertising display board outside the post office appeared interesting. Before this, we had written off Mellor as a place to live, as we had no car, couldn't drive, and so Norman depended upon travelling by train into Manchester each morning to get to the College of Commerce, as it then was, where he lectured. Mellor would be a little too far to walk, we thought, little knowing that Mellor began at the end of Town Street, Marple Bridge. As my pregnancy was making it rather more difficult for me to get around, Norman decided to go later by himself to inspect the house. When he realised that not only was it within walking distance of the station, but also had a frequent bus service passing by, our interest became even stronger. An appointment was made and we both came to look around the house and garden. The house, it has to be said, was not in great shape. The decoration was gloomy and, it being March, there was an air of chill about it. The garden, however, and the views, were marvellous. That, and the fact that the house was so similar to the one in London where I had grown up, sold it to us. We could just about afford it and we made an offer, nail'biting until it had been accepted. The timing was just about right we thought, but little did we think there might be a delay. The ladies found that their new house was riddled with dry rot and their building society would not grant them a mortgage until it was remedied. What could they do? What, indeed, could we do? Naturally we told them that they should stay at Woodlands until their house was ready for them. By the time it was, our baby was due. I left our rented house in Cheadle to go into the maternity hospital and gave birth to our daughter. Norman moved our bits and pieces into Woodlands, and had our new washing machine and cooker delivered and connected and, after giving birth to our baby, brought her out of hospital to go into our “new” home. There was next to no furniture. The house was badly in need of redecoration, new floor covering, light bulbs, and a mat in the mat well. All the power points were live and dangerous. Stair carpet, despite a promise to leave it for us, was taken along with the light bulbs. Our baby had her equipment. We had a bed, wardrobe and chest of drawers and that was all. Gradually, with the help of relatives, purchases over a number of years, and painting and papering, the house began to take on an aspect of at least being furnished and cared for. With eventually three children, it was always in a mess. As I am not the most organised of people, it is still in a mess. When we first came to view the house, the residents, Mrs. Wolfenden and her family, cooked on a freestanding gas cooker and the oven of the bungalow range. Bungalow ranges were a type of cooking and heating system and the poor cousin to the kitchen range of Victorian times which, in modern times, are similar to Aga cookers popular today. In a bungalow range, cooking in pans had to be done on a contraption that hinged at the side of the fire and could be swung over the coals when required. There was a lever to shut off the heat from the back boiler to allow the heat from the fire to travel around the flues surrounding the oven. It would appear that a choice had to be made between the hot water supply and cooking. This probably worked very well once you got the hang of it. I never took advantage of this, preferring to use the ovens overspill warmth to air the baby's nappies while keeping the water hot. Neither did I use the gas stove. We bought an electric cooker and had the gas cut off from its supply in the cellar below. Central heating, installed later, caused us to be reconnected to the gas supply but no longer on a party supply pipe through the cellar wall from next–door. In the house in 1963, coal fires were the only supply of heating. All the rooms had fireplaces, apart from the bathroom and toilet. Even the small servant's room had a fireplace. In the days when a servant was employed, perhaps these fireplaces were used but, by the time we came, they had turned into a nuisance. I had no intention of carrying coals and cinders to and fro, upstairs and down, to provide fires in the bedrooms. The hallways were freezing cold in winter and there was no incentive at all to carry on long telephone conversations on the only phone situated in the hall on a small wooden shelf. Now we have central heating, we can use all the rooms in the house in comfort and a telephone conversation can be held wherever the phone is accessible. There is no shivering caller on the end trying to put an end to a conversation to get back to the nice warm fire in the sitting room. The central heating boiler lives in the “outside-cellar”, as does a freezer and a washing machine. Woodlands still sports two fireplaces in the rooms downstairs, in case of power cuts, but all the upstairs fireplaces are removed and blocked up, so preventing birds from dropping their nest material down into them and their nestlings toppling over to be caught halfway down on the ledge that most chimneys contain. The distress of mother birds is only equalled by the consternation of the human beings inside the house, trying to extricate the bird and clear up the mess of the sooty nesting materials. However, Glenholme still has its original fireplaces, surrounded by attractive Art Nouveau tiles. What are the legacies from those who had lived in our house before us? We have a lovely original wooden mantle and tiled fireplace in the dining room, a thirties fireplace in the front sitting-room, probably put in by the Bees, and we have the green mangle donated perhaps by the original owner of the houses, Walter Stafford. There is the large lawn that was set down as a tennis court, a number of fruit bushes and apple trees planted by, perhaps, the Bees and the Wolfendens with the two original trees nearest each of the houses almost certainly planted by Walter Stafford. One of these trees is still alive and producing a little fruit. Another tree was on the edge of life in 2006 but has since fallen down. The rhododendrons that probably came from the estate in the Goyt Valley near Buxton and Long Hill when it was flooded for a reservoir are well established and give pleasure every year. These probably also came via the Bee family. We demolished the old air–raid shelter. It was useless as a garden shed and we could think of no other need for it. The base now serves as a store for our wheelbarrows and a place on which to put barbeques in the summer. The hedges that were stipulated in the deeds to surround the land are still in place. Who planted some of the roses is hard to tell but there are some very old plants that still bloom each summer. Most of all, for me, Woodlands, or number 111, is the home that has seen the history of my family from its early days to the present, from Norman and me as a young couple with our first baby to our three children, their partners, and our four grandchildren and, finally, to Norman's death in 2005. Norman's career saw him moving to lecture in economics at Manchester University in 1964 to 1965. After a life spent in the study and development of economics and the environment, he retired in 1996, but continued to work full–time at the university for another two years. Retirement allowed him to choose the subjects he wished to pursue and he was working on academic papers until shortly before his death. In retirement he developed an interest in watercolour painting and, as usual, did not do things by half. He occupied his leisure time with research into painters who interested him, learning how to paint with the help of books and courses. Our children were educated first at Ludworth Primary School and then Marple Hall High School after which they went their several ways, to colleges, employment etc. For a long time my life was circumscribed by the bus timetable and it felt very strange when the time came that there was no–one coming through the door a few moments after the bus had passed. Two brides have left Woodlands for their weddings. Eventually our son bought a house and also moved out and so, with Norman's death, I am the only one of our family now left in Woodlands. When Norman and I first moved into Woodlands, Mr. and Mrs. Booth and their daughters Pamela and Nancy were living next door in Glenholme, number 109. Mr. and Mrs. Booth were good neighbours to us. They would have liked to buy part of our garden to even out what they had wanted seventeen years before but we did not want to sell the prize that had tempted us to buy Woodlands when we first saw it. Eventually, Pamela married and moved away to her own home in Townscliffe Lane. Nancy, who was quite a lot younger, went through art school, then married and also moved away. Finally, Mr. and Mrs. Booth returned to the Southwest, having sold Glenholme to Jill and Ron Robinson. Jill and Ron are still living in the area. After a few years, they moved to Clement Road and later to Mill Brow. While they were next door, Jill helped our girls with their French homework. When their little boy was born and, as he grew older, he soon toddled into our garden to “help” Norman with the gardening. Sometimes he played with our son, Julian, inasmuch as a toddler and a boy of around ten can play together. Glenholme was bought by Judy and Malcolm Cooper who moved in with their 20–month–old baby girl, Helen. A year later, Jill was born. Helen and Jill, too, when they were small, would come and help Norman in our garden. They are now grown into young women, making their own ways in life. Judy remained my valued next–door neighbour but she and Malcolm, like many couples, have parted. Now, in 2010, I have new neighbours in Glenholme. Judy has moved to live on the edge of New Mills. Her younger daughter Jill has married and Helen, her older daughter has also moved away. When we first moved into our house, we were told that the fields beyond our garden had been sold to a builder. This builder, William Lomas and Sons, attempted to acquire planning permission to build a housing estate upon all the fields he had bought, which would have meant houses covering all the land between our houses and the crest of the hill we can see from our windows. For a while, it seemed that one of the reasons for buying our house was to be wiped out. The newly formed Mellor Society fought the planning application and not only won but secured it against later development by persuading the council to reclassify the land as Green Belt. While the planning application was under way, the land was used for keeping young cattle. As the fences were badly decaying, the cattle often threatened to get out of the field. One morning I noticed a bull calf in the garden. Trying to drive it back the way it had come did not work. The little beast escaped over the flowerbeds, out of the garden and was seen running up the hill towards the Royal Oak. I phoned our local policeman who, with the farmer, managed to capture him and return him to the field. Not long afterwards, a double fence of barbed wire secured the field boundaries. Later we were told that the builder had been declared bankrupt and the farm was sold off, lot by lot. Various local people bought fields and parts of fields. When a new site was required for Mellor School, this was purchased from the then owner and so we have our fields that we can see from our windows and a new school whose children we can hear at playtimes. Now that our houses have come to their hundredth year, we continue to live in them for the time being. How long the houses will survive is anyones guess but each reflects, to a certain extent, those that have lived in them. Over the years, each resident has made changes, added a bit or subtracted another. Tennis on the back lawn has given way to bowls and the odd game of cricket or football. The kitchen garden no longer covers the area it did. There are fewer fruit bushes and more lawn but there is a dedicated vegetable patch alongside the “orchard” as my children christened it, with the old apple trees struggling somewhat to produce their fruit and me struggling to use it all. (The small boy that helps nowadays is my four–year–old grandson. He has his own set of gardening tools and loves to dig in the vegetable patch)*. Over forty years later, I still love my house and garden and want to live in them for as long as I possibly can. Woodlands and Glenholme, I know, will outlive me. Since this revision was begun, Judy Cooper has moved from Glenholme, 109, to live in a cottage in New Mills. My son, Julian, has married Karen Coles and they still live in Great Moor. Life at Woodlands, 111, goes on. I have new neighbours on the other side of our party wall, John and Laura, with her small daughter Adelaide. 1.Source for table of ownership and occupation of 111 and 109 are house deeds for both and electoral rolls. 2. Census material supplied by Roy Cox, Old English Lister. * When revised in 2010, this little boy was eight years old and his little sister, born since this account was written, was the four–year–old who may help in the garden and also inherit the garden tools her brother once used.